Guests on Royal Caribbean's Symphony of the Seas will have the opportunity to see brand new shows that were produced for the largest cruise ship in the world, including a headliner show that combines high-energy with high-tech. Headlining the playbill will be the all-new show ‘Flight: Dare to Dream,’ a one-of-a-kind journey through the past, present and future of air travel and space exploration that will make history as one of the most ambitious stage productions to date. Guests take off on a spectacular adventure through time, chronicling key milestones in aeronautics, beginning with the first leisure voyage to Mars and ending with a stunning homage to the Wright Brothers’ first flight at Kitty Hawk. A Royal Caribbean Productions original, ‘Flight: Dare to Dream’ introduces cutting-edge 3D flying technology, video and automation to the 1,401-seat Royal Theater. Going where no stage has gone before, space and zero gravity will be simulated as actors “float” within a detailed replica of the International Space Station (ISS). 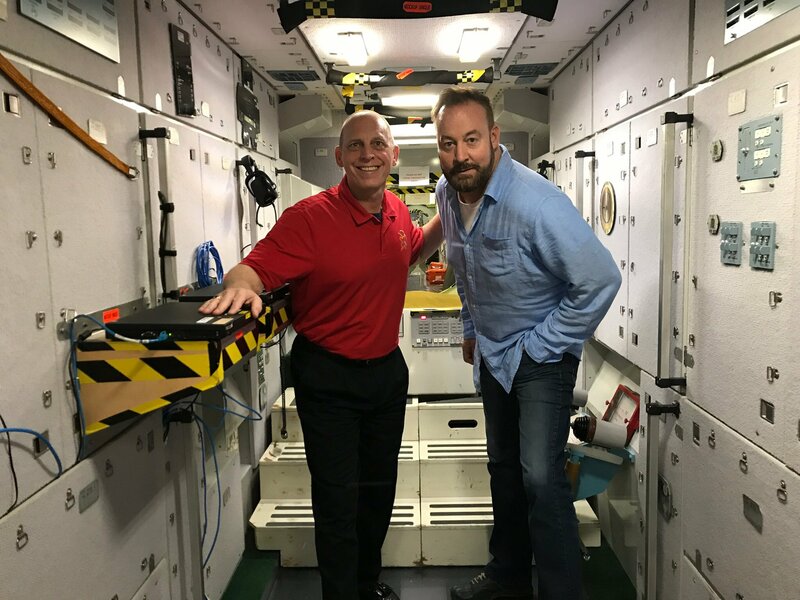 The first theater set piece of its kind, the detailed design of Royal Caribbean’s ISS was informed by Astronaut Clayton C. Anderson, who lived 167 days in space and completed 38 hours and 28 minutes over 6 spacewalks in two separate missions. Clayton Anderson & Nick Weir. Photo by Nick Weir. 1977 in Studio B is the continuation to “1877,” the ice-skating show introduced on sister-ship Harmony of the Seas, featuring the time-traveling hero, Tempus. In his latest adventure, Tempus heads to London where a mysterious jewel thief with special powers has stolen the Queen’s crown jewels on the eve of her Silver Jubilee. Timing is everything in this imaginative original ice show, featuring high-tech projection mapping images that bring the ‘70s to life on the ice. Hairspray, a guest favorite, gets a makeover for Symphony of the Seas with new choreography and staging of the Tony Award- winning musical. The larger-than-life, Royal Caribbean Productions’ original introduces revolutionary set design, taking the story of loveable teen Tracy Turnblad in 1960s Baltimore, to the next level. HiRO raises the bar on Royal Caribbean’s aqua shows with more high flying feats, unexpected stunts and extraordinary acrobatics than ever before. Brought to life by the world’s best extreme-sport athletes, HiRO pushes the limits of a theatrical production at sea with cutting-edge technology and choreography and. No two shows are the same, making it worth seeing twice. The show features 3D flying technology used by aerialists as they literally soar above the crowd, plus acrobats and professional divers.